This hasn't been the best year for beef in my area. I don't know if it's nationwide or just my area, but every single roast that I have bought has been relatively horrible. They have been tough, or too small or lacking great beef flavor. The local super store in my area doesn't feel the need to have any beef roasts over two pounds. I think they might have a different idea of an actual roast. They cut them the thickness of a steak and try to label them as a roast. The other stores in my area haven't seemed to do much better. Normally I have no problems finding great beef, but this year I have almost given up on buying any more beef. This week I decided to try one more time and prepared a recipe for a Chuck Eye Roast from the May issue of Food and Wine magazine. This recipe has 10 ingredients. As I stated in the introduction I had to go to multiple stores to find a beef roast over 2 pounds. The one I found wasn't completely marbleized, but I settled on what I could find. I had an even worse time finding ground bay leaves. I'm sure in larger cities it is easy to find a variety of spices. When I lived in Seattle there were whole stores specializing in hard to find spices. However, here I am limited a handful of stores and ground bay leaves were one of the spices that is not available at all in my area. So I left it out. Instead I substituted 1 teaspoon of ground sage. 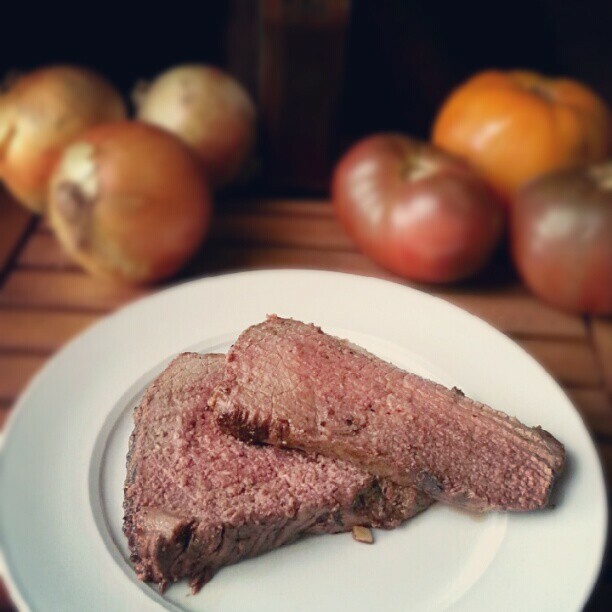 My beef roast took exactly 1 hour to cook. Make sure to tie off your roast with twine to ensure your meat stays moist. I followed the remainder of the recipe as written. I love beef roast and I have been disappointed with the last 3 roasts I have made this summer. This roast was the exception. The middle of the roast was very moist and tender and the spices worked very well together. The cooking time was perfect and I loved the sweet paprika. This recipe made me remember what I love about oven roasts and I will definitely make this again. For the recipe go to Chuck Eye Roast. I haven't had a roast in ages! I've had a hard time finding good fresh fruits and vegetables too this summer. I think with prices rising at 10 and 15% in a week it's possible that grocery stores are trying to keep prices down by sacrificing quality. It gets harder and harder to feed my family. I wish I could go back to spending less time shopping and more time cooking and baking. Here from the hop. Following you!